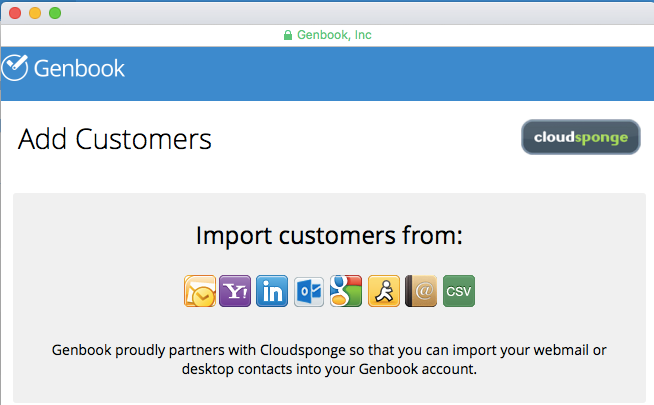 Genbook's CloudSponge-powered import tool gives your business many options for importing contacts into your Genbook account. Import contacts from Facebook and LinkedIn, a variety of Web email accounts (Gmail, AOL, Yahoo, and others), as well as programs on your own computer (Outlook, Apple Contacts). Imports from any of the above locations also contain customers' full contact details (including street addresses and phone numbers), instead of just names and email addresses. In your Customers tab, click the "Import" link at the top right of the screen. Then, choose the "Gmail" option from the menu. 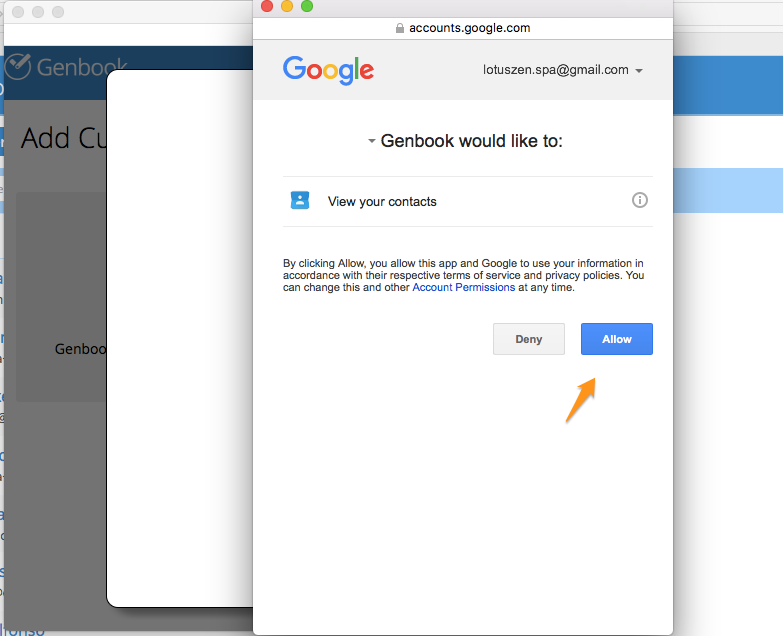 When asked whether you want to grant access to your Gmail contacts, click "Allow". A list of your contacts will appear. You can uncheck the boxes beside any contacts you don't wish to import, then click the "Next" button to finish the process. 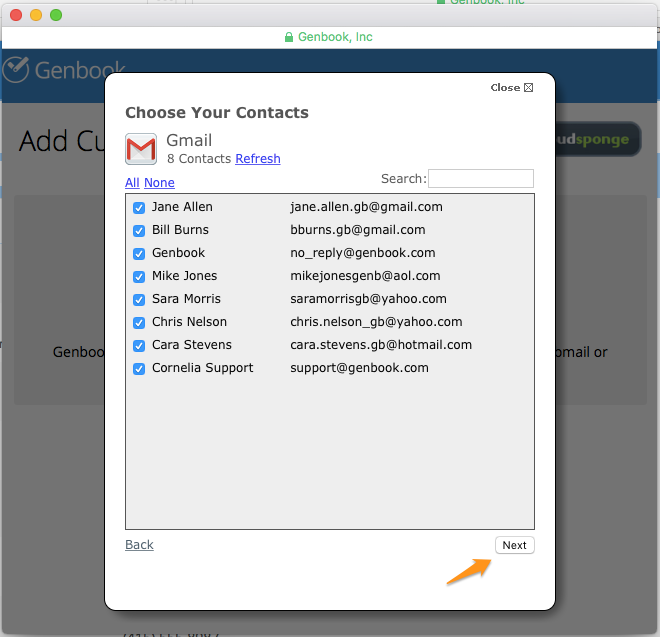 The Gmail contacts you just imported will now be listed in your Genbook Customers tab. Click on any contact to see all the details associated with them. The process should be similar for other Web email providers. It's also possible to import a generic CSV (Comma Separated Values) file from your computer, whether you created it via Excel or another tool. Simply click the "CSV" option at the end of the list of import sources, then follow the steps to locate and import the file from your computer. TIP: Only some of the data will import from a CSV file. If your CSV is a file that you created in Outlook or a similar program for which we offer a specific/dedicated import option, we recommend importing directly from that program so that more of the client information will be pulled.